After two critically acclaimed NXT specials for WWE, did NXT Takeover: Fatal 4-Way with Adrian Neville defending his NXT Championship against Sami Zayn, Tyler Breeze arecreate the magic of the first two? Let's take a gander. Before getting into the main event, let's talk about the pre-match build up. WWE used four seperate build up packages, placed throughout the show. Each package focused on a different participant in the main event, including short interviews with each man. It was a simple but effect method that made the match feel not only important, but got over each man's character for anyone new to the product. All four men put in competent efforts, with Neville's promo sewing seeds cleverly for the upcoming match, Kidd continuing to develop his new heel persona, Breeze nailing it with the line "Everything I wear matches gold" and Sami Zayn managing to be more likeable than the entire WWE roster in less than minute. The match itself, may be one of the best Fatal Fourway bouts that I have ever seen. Whilst the wrestling was (more or less) spot on, it was the booking that made this match so special. By having Neville on the outside for most of the match, it meant his exciting highflying offence was kept to a minimum (which is a strange thing to say as a positive, because I do like me some flips), whilst Sami Zayn was left to battle Tyler Breeze and mainly Tyson Kidd. This got the crowd firmly behind Zayn, who's selling is some of the most believable in wrestling. With a handful of false finishes, like a flurry of offence from Breeze, Breeze almost stealing a pin off a Shooting Star Press from Neville on Kidd and Breeze almost tapping whilst in a Sharpshooter from Kidd, with which the match could have ended without a whole lot of complaint, the stage was set for Sami Zayn to win the NXT title. A terrific sequence of action, taking in a crazy suicide dive to Neville, a Tornado DDT (Similar to the ones on Cesaro in their clashes) on Breeze and a Helluva Kick to Kidd, the crowd (and myself) was convinced that Zayn was about to walk away with the title. However, Neville made enough of a recovery to pull the referee out of the ring, hit Zayn with a Superkick on the outside and hit Red Arrow on Kidd, allowing him to hold onto his title. This is where having Neville spend most of the match on the outside paid off, as it was clear that he probably didn't deserve to win the match, and after seeing Zayn battle so hard throughout the contest, it was difficult not to feel aggrieved that he wasn't walking away with the title. Obviously, this is exactly the reaction WWE was after, and they got it with the live crowd and social media both seemingly frustrated that Neville retaining, whether they knew they had been manipulated or not! With just enough of a tease at what Zayn vs Neville could be like during the match (despite the only botch of the match, where it appeared Neville was attempting a Reverse Rana) to get the fans wanting to see another one on one clash, the stage is set for the next special already. Will Neville's heel turn be effective? Against Zayn most likely, as it's easy to hate anyone attempting to do damage to the former Generic Luchador. Elsewhere, Neville would almost certainly have to drop a lot of the highflying elements of his moveset, for something a little less flashy. A competitve rivalry over the title however, with Neville remaining babyface could be the most effective decision. This match got the pre-match vignette treatment as well, with a very effective video package. Similar to the build up videos for the Fourway, both wrestlers were interviewed about the upcoming match. Both characters were set up nicely, and it made it even easier to become invested in the match. Bayley's promo in particular was a pleasure to watch, conjuring up real emotion, showing just how far the character has come over the last six months. The match itself didn't do a whole lot for me. As far as women's matches in WWE go, it was above average, there's no doubt about it, but in the big wide world, it wasn't quite what it could have been. Bayley spent a long time in a Figure Four Headlock, including some very cool roll throughs, which was an interesting variation on the rest hold and got the crowd fully behind Bayley. This made a lot of sense, as it would weaken Bayley for Charlotte's Natural Selection finisher, unfortunately, Bayley didn't sell the neck. It may sound to many, like I'm being picky, but if Bayley had sold the neck, not only would it have increased the audience's empathy for the character, but also would have been a perfect way to keep Charlotte in the match with the preceeding run of roll up's from Bayley. If we'd have seen Bayley grab hold of the neck, allowing Charlotte to kick out at two, it would have made this match so much better. There were some impressive moments that made this stand out from a regular "Divas" match, like Bayley's Super Hurracanrana and some creative sequences of reversals, but these lacked the flow they needed to really elevate this match. Charlotte went on to pick up the victory, with an awkward Moonsault, followed up with Natural Selection to retain her title. It wasn't quite the feelgood moment that I had been expecting,o and the lack of story direction in the closing stages of the match left me feeling a little numb, when the pinfall was counted. This was a decent WWE women's match, but it could have been so much more with a few extra touches. Following the match, Sasha Banks attempted to attack Bayley, with Charlotte making the save. It would appear we'll be seeing Sasha Banks vs Charlotte for the title in the near future, with Charlotte turning face in the process. I'm worried Charlotte will struggle as a babyface, because of her size, and after seeing her work so effectively as a heel opposite Bayley, I'm not sure I particularly want to see this either. Sasha Banks has developed enough on the mic to make this feud work however, so I'm happy to see how this one develops over the coming months. The most eye catching thing on undercard was the debut of KENTA who was introduced by NXT General Manager William Regal. Everything about this segment made KENTA (renamed Hideo Itami) look like an absolute star. There was a real focus from both Regal and the commentary team to get over Itami's achievements and just how much of a big deal him signing with WWE is. Even if you had no clue at all who KENTA was, you knew that he was someone to watch out for. This continued, as The Ascension came out in an attempt to show up Itami, but got royally schooled by the newcomer. Itami took them down with a flurry of offence, finishing up with a Double Dropkick sending Konnor and Viktor to the outside. Taking out the most protected entitity on the NXT roster in your debut is always going to make you look good. 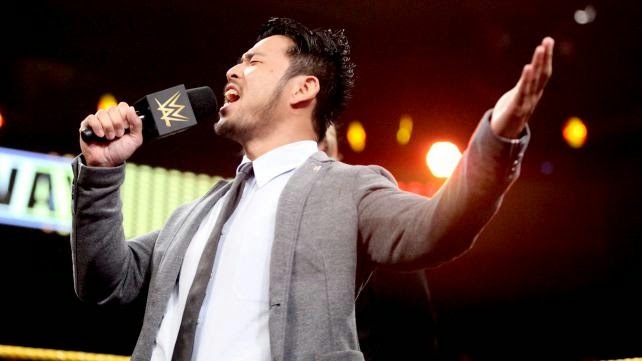 WWE clearly has high hopes for Itami, it will interesting to see who they pair him with for his first match next week. The Ascension were in action earlier on in the show, defending the tag team titles, against Sin Cara and Kalisto, in a solid opening match. Again this match was made by the booking, with The Ascension dominating early, allowing for a terrific hot tag to Kalisto, who has some very cool offence. It wasn't a particularly complicated match, essentially sticking to a basic tag team format, but the crowd was very into it, with an exciting closing sequence, ending with Kalisto hitting Salida del Sol on Viktor to pick up the win and the tag titles for the newly christened Lucha Dragons. It was a good surprise victory to open the show, with many expecting The Ascension to retain the belts, there's now every possibility the two will be promoted to the main roster soon. Enzo Amore and Sylvester LeFort attempted to go where many had failed and create a decent Hair vs Hair match. Did they succeed? Not really. The match was fairly basic, in both structure and the wrestling in the ring. Whilst there was a nice pace to the beginning of the match, it soon broke down and I quickly found myself losing interest. A decent false finish off a Lariat for LeFort was the only thing of any note. Amore's charisma on the microphone and entertaining partnership with Big Cass managed to keep this afloat, but not delivering on shaving LeFort bawld, made a mockery of the stipulation. We did get a bawld Marcus Louis however, due to some magic hair removal cream. Rounding off the show, were two squash matches, with Bull Dempsey running through Mojo Rawley in a sloppy brawl, that was difficult to care about. I cared even less when Dempsey attacked Rawley post match. My indifference towards CJ Parker was also rewarded as the debuting Baron Corbin made easy pickings of "The Moonchild" picking up the win in a matter of seconds. For two hours of wrestling, this was a good show, I wouldn't argue if you said a very good show. The Fatal Fourway was an incredible twenty minutes plus of action and even with my complaints about the Women's match, it was still a decent match. Did it live up to the other two NXT specials? I don't think so, but I think that says more about the quality of those shows, than it does about this one.